The grapes were harvested five days apart and fermented separately, as in years past, keeping this year’s Pinot Gris much like the last. 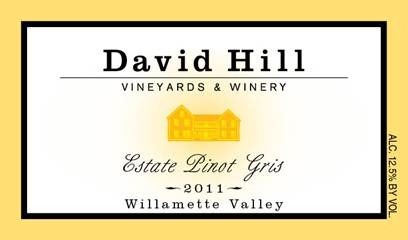 Processed separately, we take great care in producing our all of our Pinot Gris. The two lots are fermented separately, with different strains of wine yeast, creating a wine that is bright with aromas of citrus and stone fruit along with a mouth feel that is filled with fresh fruit followed by a nice crisp finish. A lovely Pino Gris, here is the perfect summer white. 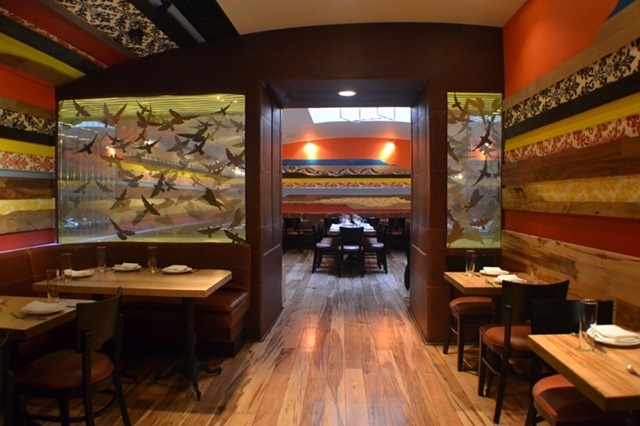 This Upstairs Room is also available for private events. 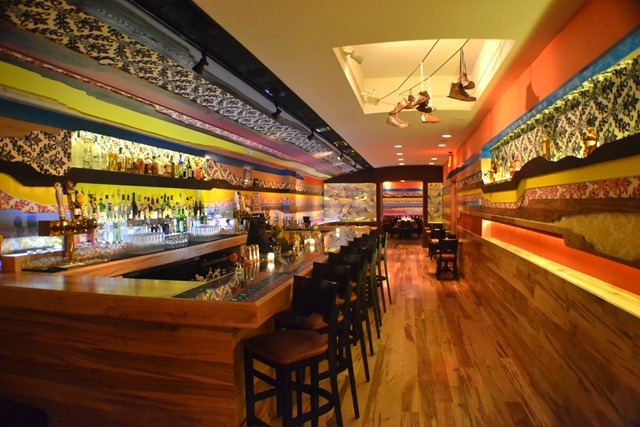 (Call 212.582.1400 for private event pricing and details). 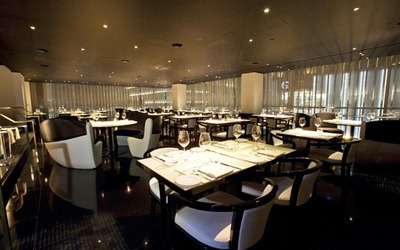 Upstairs at ’21’ is an elegant 32-seat restaurant located one flight up from the world-famous Bar Room. Available for private events or an intimate dinner, you’ll find inspired cuisine in an exquisite salon-like setting framed by vivid murals of four New York landmarks set in the mid-1930s. Brooklyn-based artist Wynne Evans created the murals especially for Upstairs at ’21’. This intimate room envelops diners in a warm glow as detailed, attentive service pairs with creative dishes and outstanding wine to create an enchanting and memorable evening to be savored for years to come. The charming Captain, Christopher Smith, is warm, knowledgeable and adept . He will guide you through the Upstairs menu, which at $75 for three courses, with few supplements, vies for the best value is luxury dining in Manhattan. Offering a choice of some 10 appetizers, 14 entrees and 9 delectable desserts, dinner starter highlights include a light Cornmeal Crusted Crab Cake with pickled corn relish, impeccably Crispy and Tender Veal Sweet Breads and white asparagus, a composite of Deviled Egg with Lobster, diced lobster, American caviar, Imberico ham, shaved asparagus and garlic aioli and perfectly Grilled Spanish Octopus, artichoke barigoule, fingerling potatoes and basil purée. Japanese Eggplant with Tomato • or Creamy Potato Purée with Ramps (all $10 additional). The wine list with some 1,300 selections spread over 15 countries,offers something for everyone and despite its encyclopedic scope, proposes attractive selections under $40. Desserts and beautiful, but delightfully unfussy. The feathery Grand Marnier or chocolate Soufflés are exemplary, while the decadent Peanut Butter and Banana Sundae, blending peanut butter ice cream, banana ice cream, candied peanuts and chocolate sauce or Toasted Coconut Cake, passion fruit custard, coconut Anglaise and pineapple sorbet would turn grandpa into a twelve year old. The orchestration as a whole is beautifully overseen by restaurant manager Michael Jenkins. Coupled with silky service and some of the best Martinis in town, Upstairs at 21, 21 W. 52nd. 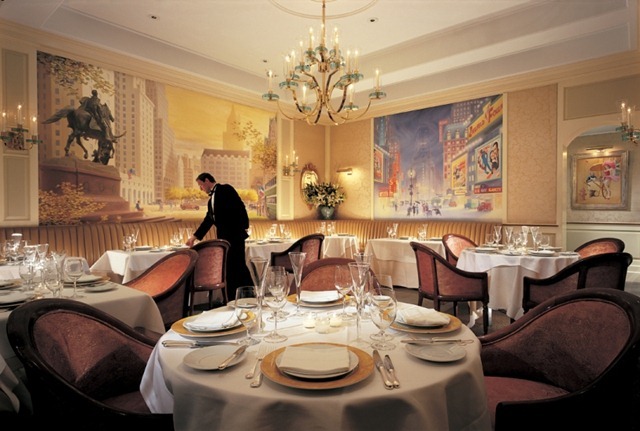 St., is one of the most romantic places to enjoy a superb dinner in New York City and 21 remains one of America’s finest restaurants and rates A Major on THE WALMAN REPORT. The Orchard House is located at 146 Orchard Street. Dinner: Tuesday & Wednesday 5:30pm–10:30pm; Thursday through Saturday 5:30pm–11:30pm. 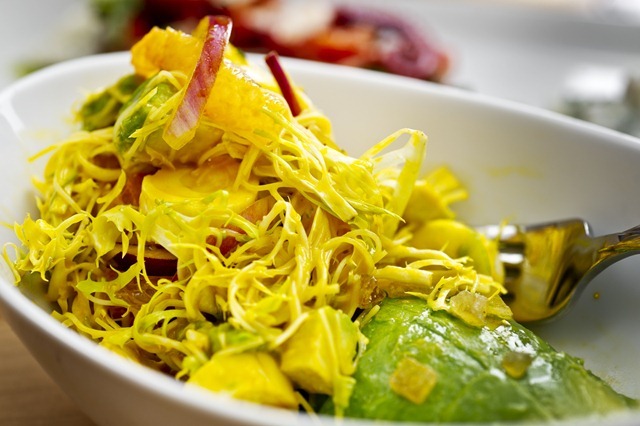 Lunch (Starting June 6) Monday through Friday 11:30am–3:00pm. For more information, please call 212-777-8600, visit their website at http://www.theorch.com, follow them on Twitter at @theorchnyc, or Like The-Orchard-House on Facebook. The eye-catching Orchard House, concept of owners Teddy Kambouris and Kevin Jackasal, is a bright, playful hub of the Lower East Side. Inspired by the area’s rich architectural past and present, designer Steve Lewis of Lewis & Dizon Designs, used the festive, open space to pay homage to the aesthetics of the neighborhood and the vibrant spirit of those who call it home, from tattoo artists to haberdashers to musicians. Diners enjoy a seamless flow from the colorful streetscape into the bright dining space, as the front glass doors completely open, welcoming patrons to sit back, relax and enjoy the eclectic scene. Teddy Kambouris and Kevin Jackasal set out to create a space where locals can lounge while visitors take in the creative vibe of the Lower East Side, feasting on everything from the eye-popping interior to the reawakened take on New American comfort food. Both Kambouris and Jackasal come from hospitality backgrounds — Jackasal began his career in the hotel industry working for the Marriott, Radisson & W Hotel Group and went on to launch New York restaurants like Kallari Taverna and Rayuela, while Kambouris was raised in New York City in the longstanding family tradition of restaurateurs. Drawing on the wisdom of Consulting Chef Matthew Redington, veteran Jean-Georges sous-chef and graduate of the New England Culinary Institute, the partners were able to create an inspired new menu that brings their vision alive in The Orchard House. The Orchard House’s menu focuses on yummy, bite-sized portions that are meant to be shared. House favorites are fresh twists on traditional American comforts, like moist and tender Lamb Sliders, mini-burgers of medium rare lamb served with minted cucumber and scallion on potato buns. 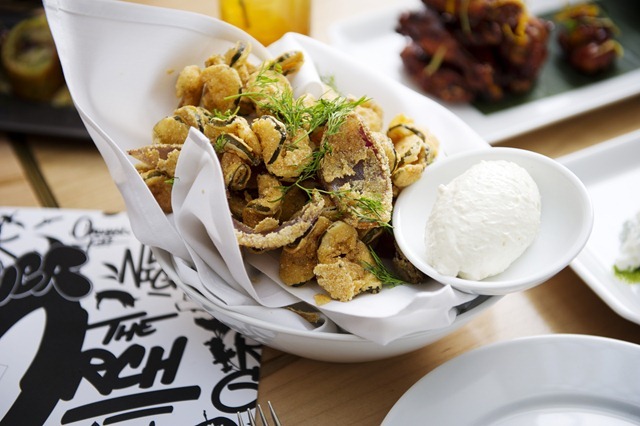 A nod to the Lower East Side is the Fried Pickles, which come as chips with a side of horseradish and whipped sheep’s milk ricotta. Or make a date with the Devils on Horseback, plump blue-cheese stuffed dates soaked in port wine and served in a sweetly caramelized wrap of pan-seared bacon. Home-style Mac & Cheese is a classic American staple, blending Parmesan, emmenthal and cheddar cheeses with traditional elbow macaroni. around the world is the sole U.S. Agent and Importers for Château La Nerthe, from Châteauneuf-du-Pape. owned and managed by the renowned Richard family, involved in wine making and wine distribution since 1892.Château La Nerthe is one of Chateauneuf’s oldest estates and a benchmark producer of the region. Located in the heart of the AOC, the 225 acres of Château La Nerthe’s vineyards are locates in a single block around the chateau and have been certified organic since 1998. The classic chateauneuf terroir of the famous galettes (large, round stones) dominate the on average 40 year old vineyards. A deep red with profound purple hints. Intense aromas with rich ripe fruits undertones, spices and various black colored berries soaked in alcohol. Well balanced on the palate with expressive hints of fig, cocoa and leather. The finish is long, complex and we note a great finesse of tanins. Outstanding Chateauneuf-du-Pape and worth every Euro. Delicious with game, beef, cheese or assertive seafood. to a variety of foods. the map. This Petite Sirah calls out for big, juicy steak. As Summer descends upon New York City a bounty of beautiful dishes are gracing the menu at the stylish Armani/Ristorante 5th Avenue, where Executive Chef Roberto Deiaco continues to wow diners with his gorgeously composed dishes, keeping the essence of classic Italy and infusing a modern twist. Giorgio Armani collaborated with innovative architects Doriana and Massimiliano Fuksas to design the 5,200-square-foot restaurant and bar, which offers a stunning view overlooking Fifth Avenue. The multi-level store was conceived as a single, fluid space brought together by a central staircase. The restaurant’s beige walls, black floors and ceilings, and metal fixtures, all come together to provide a suave feel that evokes movement and fluidity. Special attention has also been paid to the lighting, which appears invisible and creates a theatrical mood. The hidden lighting emphasizes the use of curves, a consistent feature found throughout the restaurant and store. 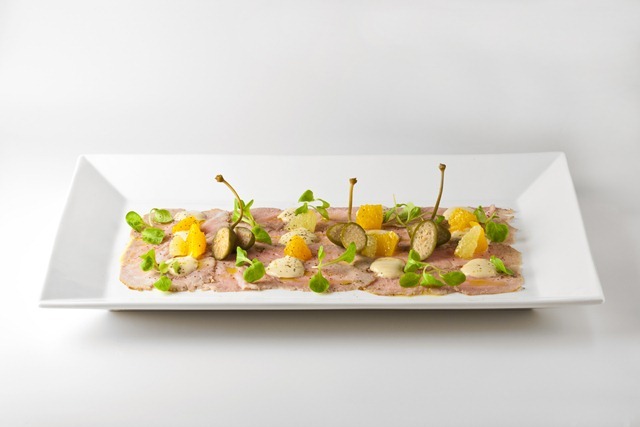 The Amazing Vitello Tonnato (thinly-sliced roast veal loin, topped with velvety tuna-caper sauce, citrus segments, and pantelleria island capers). Armani’s antipasti features an abundance of seasonal ingredients in dishes such as SPARAGI BIANCHI, white asparagus with chervil zabaglione, and house-smoked duck carpaccino and a beautifully presented dish with the best from the sea CRUDITÀ DI MARE, red beet and orange-marinated wild branzino barpaccio, blue fin tuna tartar, fresh oyster, and green apple-marinated langoustine with Italian caviar. 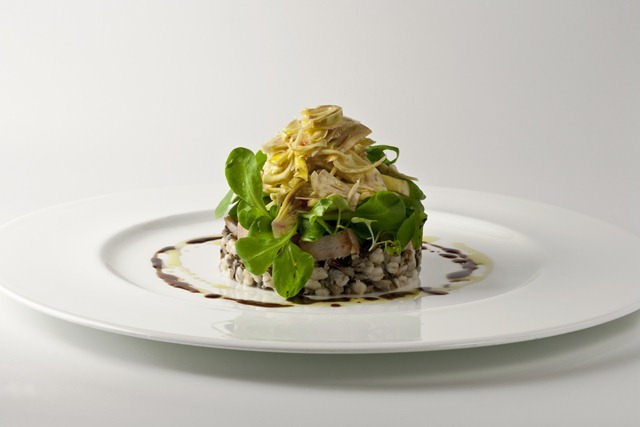 For those salad lovers there is MISTICANZA PRIMAVERILE, a crisp salad of Cipollini Onions, Chiodini Mushrooms, Baby Peppers, Baby Zucchini, Asparagus, Radish, and Fava Beans and chef Deiaco’s own INSALATA NIZZARDA a Niçoise salad with seared tuna, haricort vertes, tropea onions, olives, pachino tomatoes, and poached quail egg. One dish not on the menu, sparkling fresh Mediterranean langoustines, are served raw in a hauntingly light sauce topped with fresh caviar. Worthy of a detour in itself and probably the best langoustines we have encountered this side of the Atlantic, we hope they will become a house signature. Sure to be a favorite of Chef Deiaco’s is a selection of homemade pasta dishes such as TONNARELLI AL NERO, squid ink tonnarelli pasta tossed with baby calamari, tender tuna belly, lemon zest, and sage topped with air-dried tuna roe, the LASAGNETTA PRIMAVERILE, with thyme-roasted spring vegetables and decadent Parmesan cheese fondue as well as the RISOTTO AI FIORI DI ZUCCA, a traditional zucchini blossom risotto with Mediterranean langoustine and cognac reduction. 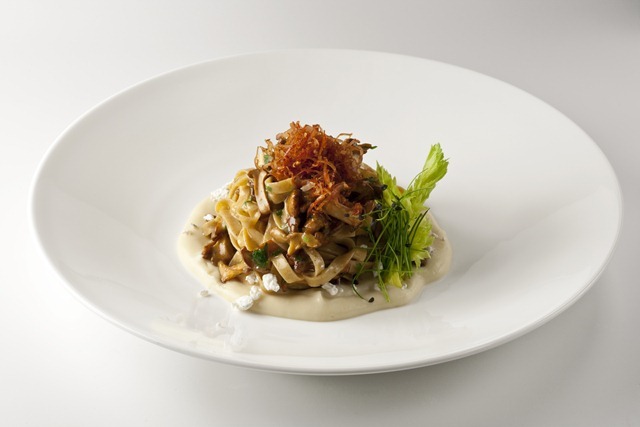 Remarkable Tagliarelle Integrali ( homemade whole wheat tagliarelle pasta with crispy "alto adige" speck, zigher cheese, and fava bea purée). For those looking for bold flavors and a moment to indulge the Secondi Piatti include MAIALINO DA LATTE, a slow-roasted suckling pig served with sweet green peas and a herbed potato puree as well as the mouth wateringTAGLIATA DI MANZO, a buttery soft char-grilled prime “Red Angus” dry-aged steak, served with stewed Sorana beans, succulent bone marrow and mixed greens. Mediterranean langoustines are the star of the SCAMPI ALLA GRIGLIA, where they are marinated with sweet garlic, grilled and served with a fennel confit. Deiaco’s LOMBO D’ANGELLO, is a savory ode to Italian decadence, as this tender mustard and green olive-crusted Colorado lamb loin shows just the right amount of pink and is served with a Vermentino wine reduction. Lasagnette Primaverile ( homemade lasagnette with thyme-roasted spring vegetables and parmesan cheese fondue). Armani/Ristorante offers an extensive collection of Italian, French, and American wines, as well as a full cocktail menu and offers their very own Sommelier Jim Clarke to assist diners in seamlessly pairing their selections with dishes.We adored his choice of a 2009 Elio Altare Campogrande Cinqueterre ($115). An elite wine form an elite winemaker, this unique wine evolved and complimented a variety of dishes throughout the meal. An Aperitivo hour is available Monday through Saturday (5-8pm) when cocktails are served with a selection of complimentary savory bites such as Panzerotti, ascolana olives stuffed with veal, Arancini and spinach croquettes, prepared daily by Chef Deiaco. Their homemade bread is continuously produced throughout the day in small batches and includes an assortment grissini, cartamusica, white bread with oregano, salt bread, and hearty whole-wheat raisin walnut bread. Do not forget to save room for Chef Deiaco’s inventive Dolci menu, which includes a SEMIFREDDO AI PISTACCHI DI BRONTE, a Bronte pistachio semifreddo with the essence of clementine and a warm chocolate caprese or his light and fluffy LA SFOGLIA NAPOLEON, with amaretto pastry creamed and bright seasonal berries. End the meal while refreshing your palate with the LA CROSTATINA PRIMAVERILE, a fresh spring fruit crostata with a tangy and sweet rhubarb sorbet. Service is smooth and professional, and for a night on the town, here is New York’s new glittering star. 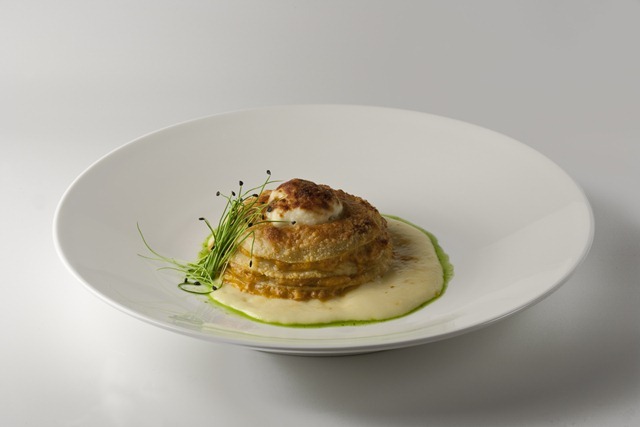 For leaner wallets, there is a changing prix fixe menu, currently a steal at $34, as well as a la carte and a tasting menu for $85 (or and additional $65 with five interesting wines) Not to be missed and “Highly Recommended by The Walman Report” and rates A Major in the Luxury Italian league. best California locations for Pinot Gris. Mexico, to India and China, all accented with a variety of spices.